This 16pc dinnerware set - sunflowers designed by Mara in a sunflower theme is so upbeat with the sunflower artistically placed on each stoneware dinner piece and on the stoneware mug. 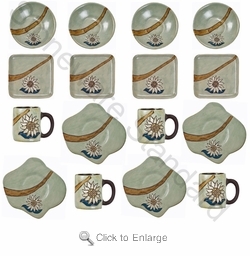 Check out our Sunflower - Individual & Complement Pieces to fill out your Mara Dinnerware set. We also carry Prado Dinnerware Sets. This fabulous Mexican stoneware dinnerware collection of five bold new glazes that was created by Juan Prado. Need to replace or purchase individual & complement pieces for this stoneware dinnerware set?